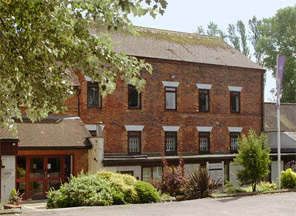 The registered office of Sub@omic Limited may be found at Old Batford Mill, Harpenden, Herts. Old Batford Mill was a working flour mill powered by the River Lea in the 19th Century and now exists as a creative hub for design businesses in Harpenden, Hertfordhsire. Old Batford Mill is just one mile from Harpenden with its rail links to St Pancras in the heart of London and a matter of minutes away from junctions 9 and 10 of the M1 and junction 4 of the A1 Google map. Approaching Old Batford Mill from Luton or Harpenden you will enter Batford on the B653, Lower Luton Road. Proceed along Lower Luton Road towards Wheathampstead; passing the petrol station on your right you will then pass Batford Springs an open common on your right; immediately after Batford Springs turn right in Batford Mill Estate through a gap in the trees then immediately turn left - Old Batford Mill will be directly in front of you. Park anywhere on the right hand side of the car park then proceed to the Reception accessed via a door entry system - just buzz us and we'll come down to meet you in Reception. Approaching Old Batford Mill from the A1 you will enter Batford on the B653, Lower Luton Road. Proceed straight ahead at the mini roundabout and within 50m take your first turn left into Batford Mill Estate through a gap in the trees then immediately turn left - Old Batford Mill will be directly in front of you. Park anywhere on the right hand side of the car park then proceed to the Reception accessed via a door entry system - just buzz us and we'll come down to meet you in Reception.